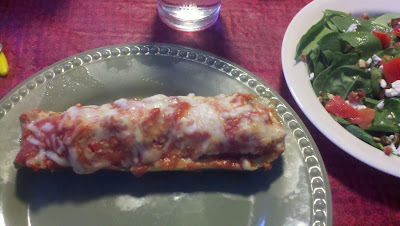 Let's just get this out of the way -- I LOVE ZUCCHINI. I use it in recipes every chance I get! The first time I made Stuffed Zucchini, I got the idea from Food.com (well, at the time it was still Recipezaar), but I couldn't find a recipe that I loved. So, I made my own! 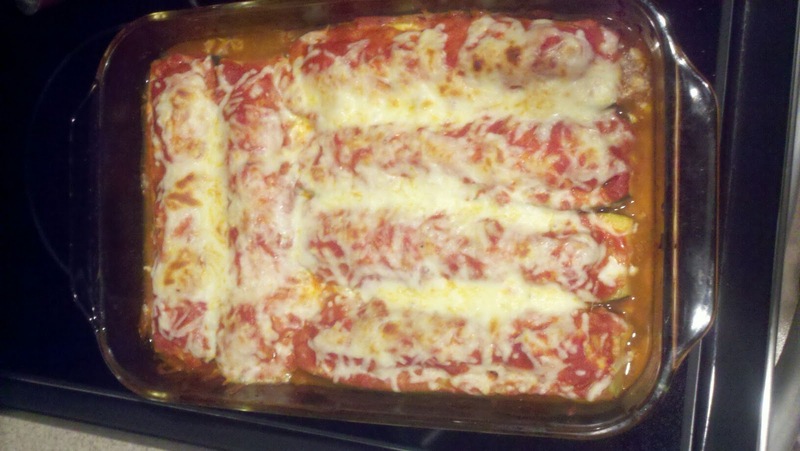 Serve with whole wheat spaghetti, a nice salad, or both! Spray a 9x13 pan with cooking spray. 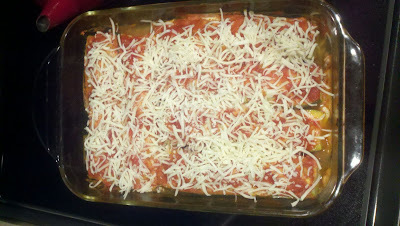 Spread about a cup of the spaghetti sauce into the bottom of the pan to keep the zucchini moist as they bake. Cut each zucchini in half lengthwise. Using a spoon, scrape the seeds out of each zucchini half to create zucchini boats, reserving the pulp. 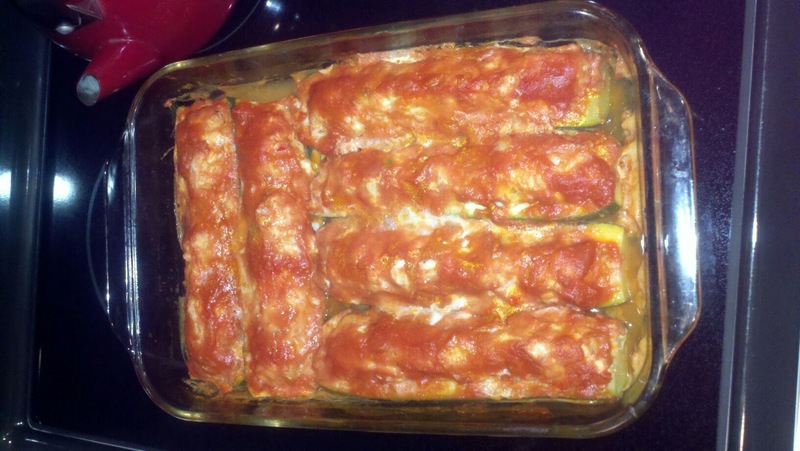 Place zucchini in pan. To make the filling, place the ground turkey in a large mixing bowl. Chop the zucchini pulp and add 1/2 cup to the ground turkey. I decided to add this in as I felt bad wasting it! You could reserve the rest to use in place of oil for baked goods. Remove the seeds and ribs from the red pepper and jalapeno and finely chop. Dice onion as well and add these to the bowl. Add in egg white, 1/4 cup breadcrumbs, 1/2 tsp garlic powder, 1/2 tsp salt, 1/4 tsp black pepper. Mix to combine -- don't be afraid to get your hands dirty! I've found that's the best method. Divide the filling among the zucchini. Depending on the size of your zucchini, you may have extra filling, but it works really well for stuffed peppers as well, so just find something else to stuff! Cover the zucchini with some of the remaining spaghetti sauce -- I didn't end up needing the entire jar. Bake at 350 degrees for about 40 minutes. Then cut into the meat to make sure it is no longer pink in the middle. 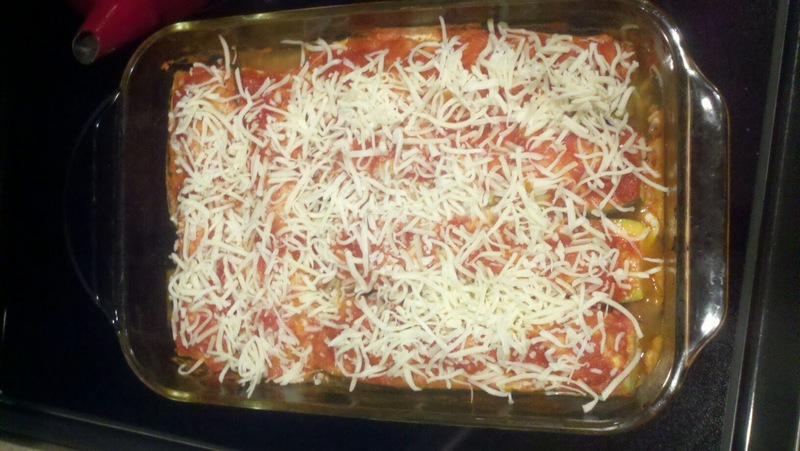 Sprinkle with mozzarella cheese and bake for an additional 10-15 minutes.